IBM Cognos TM1 is an excellent tool when it comes to planning, budgeting and forecasting. It also has hierarchy management capabilities but often you want to import hierarchies and data from an enterprise MDM solution such as Master Data Services (MDS) in SQL Server. To prevent situations like this and prevent having problems when importing data to TM1 one must be sure that there are no duplicate names or codes in the source data. In MDS this situation can be handled nicely by using MDS business rules. 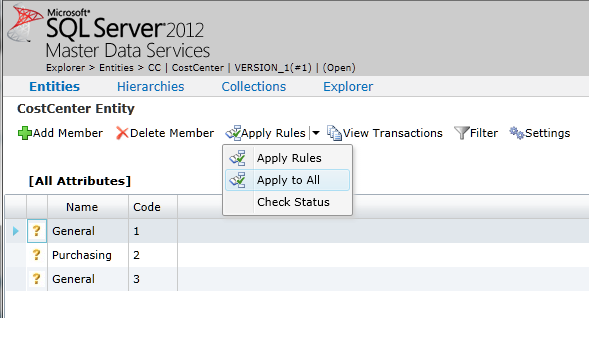 In MDS you can define business rules to automatically keep your data in shape and also make some automatic processing to your data if wanted. 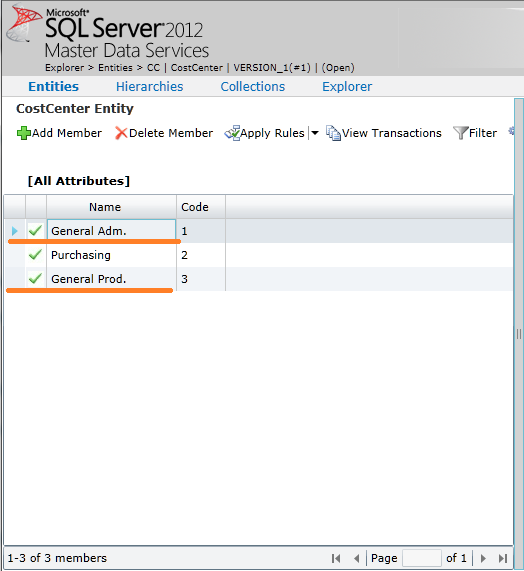 Now we want to prevent duplicate names in the cost center data (codes are automatically unique so we don’t need to think about them). As we can see two cost centers have the same name “General” and that violates the business rule definition. The red flag indicates that there is a problem with the data and it needs to be fixed. 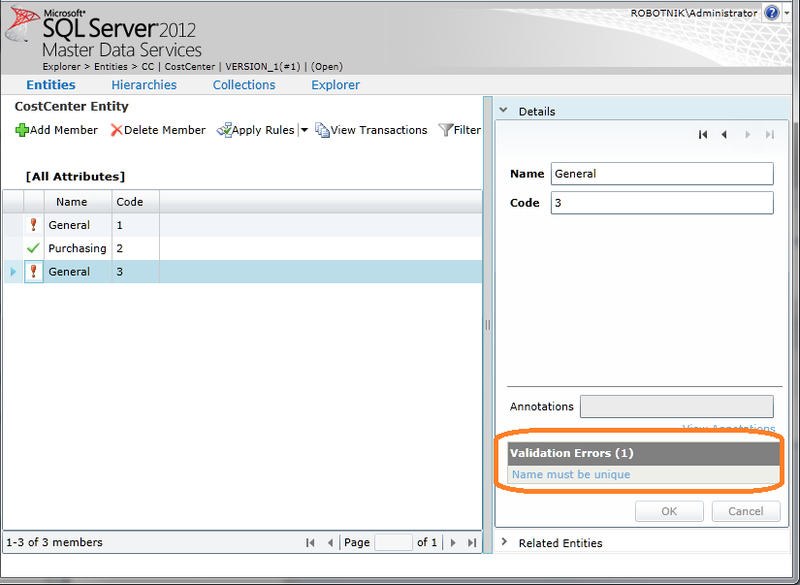 You can also define business users to have notification emails when the validation rules fail so that someone can instantly fix the issues before they are causing errors in the downstream systems such like TM1. After the the names are fixed and the business rules are applied again the situation is OK and the data meets the quality needs of TM1 and its ready to go! 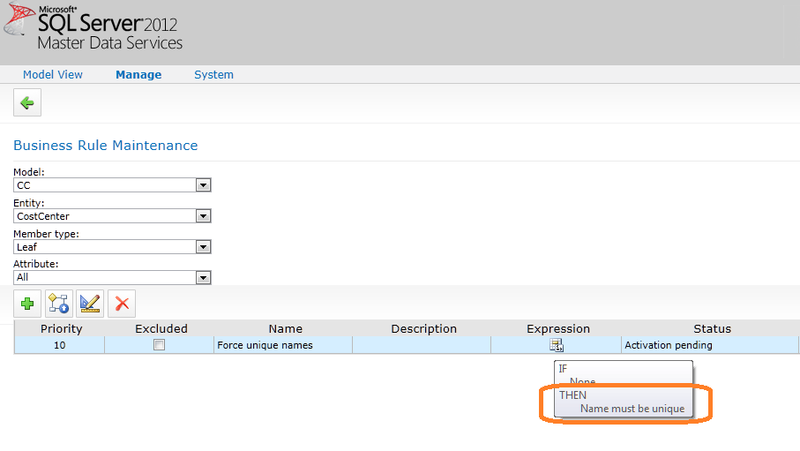 Although we can prevent duplicate names within leafs and consolidated members independently the business rules cannot be used to prevent them in both simultaneously: you can still have leaf member with name “General” and a consolidated member with name “General”. And that’s also bad for TM1. In most cases the hierarchy data goes first into a data warehousing system before it’s loaded to TM1. If that’s the case you can brute force the uniqueness of the names by storing both the consolidated and leaf members into a single table and then defining a unique constraint on the name column. That will keep your data well-formed. It’s not the most beautiful way to do it but a very effective one. Let’s hope that we can tackle this situation also in the future versions of MDS. This entry was posted on Tuesday, June 19th, 2012 at 07:10	and tagged with cognos, duplicates, hierarchy, ibm, ibm cognos tm1, master data, master data services, mds, microsoft, tm1 and posted in TM1. You can follow any responses to this entry through the RSS 2.0 feed. Great blog, stumbled here via twitter! Nice to see some of the inner workings of the BI world! The MDS Explorer GUI is strikingly similar to the Silverlight app we’ve been working on, even down to the finest little details… scary. 😀 Anyways, keep them blog entries coming!